Cables is your model kit for creating beautiful interactive content. With an easy to navigate interface and results in real time, it allows for fast prototyping and prompt adjustments. You are provided with a given set of operators such as mathematical functions, shapes and materials. Connect these to each other by virtual cables to create the scene you have in mind. Easily export your piece of work at any time. Embed it into your website or use it for any kind of creative installation. 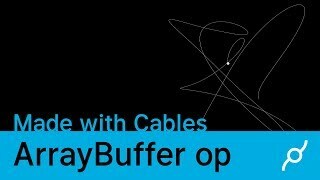 Cables will be launched for private beta soon. It will be under construction and experimental for quite some time, but it is still ready for you to play with it. 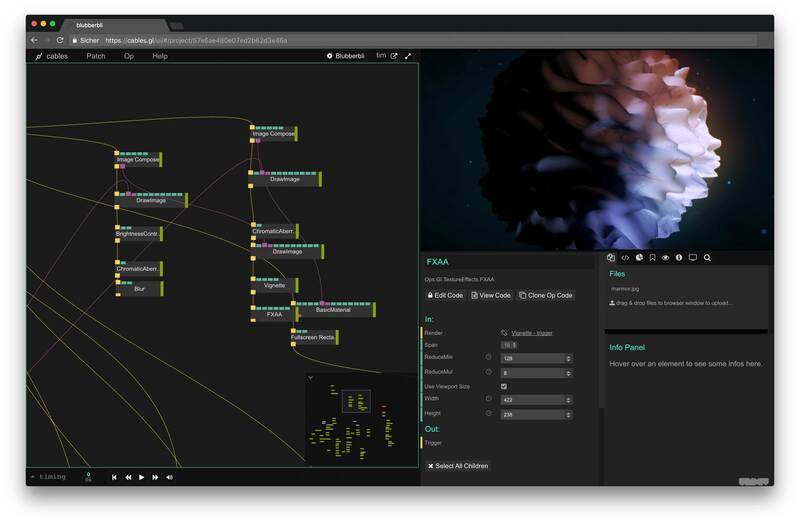 Cables is being developed by undev – a Berlin based creative studio for interactive realtime graphics, data-visualizations and app development. We are passionate coders and designer with a long history in programming for the demoscene. Need an expert to create interactive visual content for you? 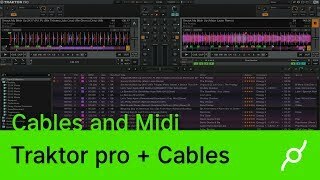 Or do you have a question about cables? Create, manage and wire projects in your browser. Cables projects run on all modern browsers, mobile devices and desktop computers. Import complete scenes from your favorite 3D modeling application by drag'n drop. Apply materials to your meshes, e.g. matcap or phong material, or write your own shaders. Virtual reality in the browser is coming soon, try the experimental VR operators. Easily use browser APIs like gamepad, midi, webcam, phone sensors. You can also use other devices' development tools such as kinect or leap motion. Cables is currently in private beta. Sign up today if you want to try it out before the official release date. Please be patient, we will invite a chunk of new users from the waiting list every week. We will provide you with information about new features and updates via e-mail. No worries, we are developers, not marketers: As we prefer writing code over emails, you can be sure we won't spam you! With the cables module kit you can create cool stuff without writing any code. Our video tutorials will help you get started in no time! With a graphical interface there is no need to bother the developer for every pixel you want to change. Play around with it, it's fun! Share your work with the team, integrate comments and group operators for easy orientation, even in big projects. Embed cables projects into your website without any server-side requirements. Exporting your work will create a .zip file containing only the code of the operators you used! Clone existing operators and modify them to meet your very own ideas. 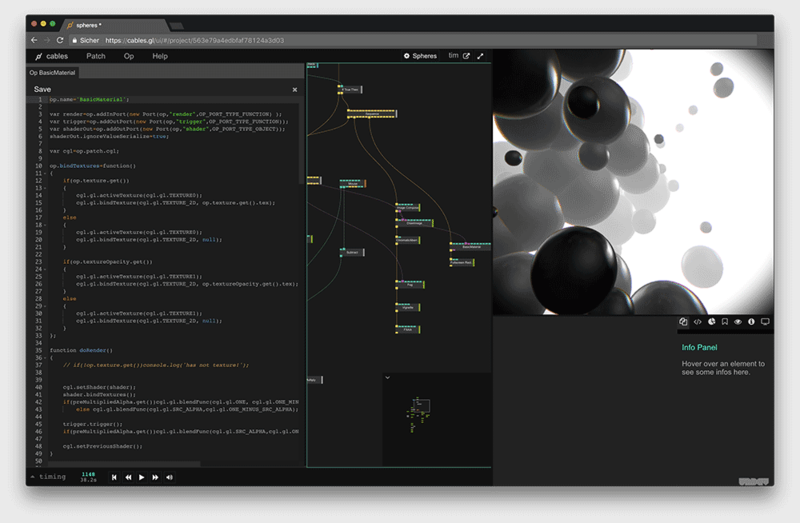 cables is inspired by the excellent desktop tools tooll and vvvv.